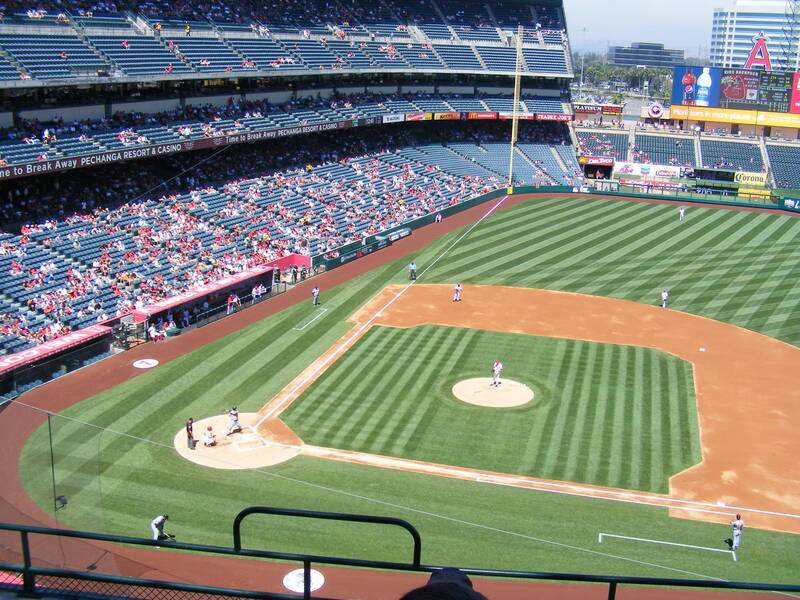 I knew I was going to head out to one of the Angel games against the Tigers this week. I randomly chose Tuesday’s game. As it turns out, the weather was not a friend to me on this day. This will be a pretty quick entry because not a lot happened. I left in plenty of time to get to the stadium before it opened. As I was driving along the freeway it started to rain. Ridiculous. Then the rain let up… then, as I got of the freeway it picked up again. Ugh. I parked and walked up to the outfield tunnel to peer in at the field. I was disappointed to see the tarp out on the field. 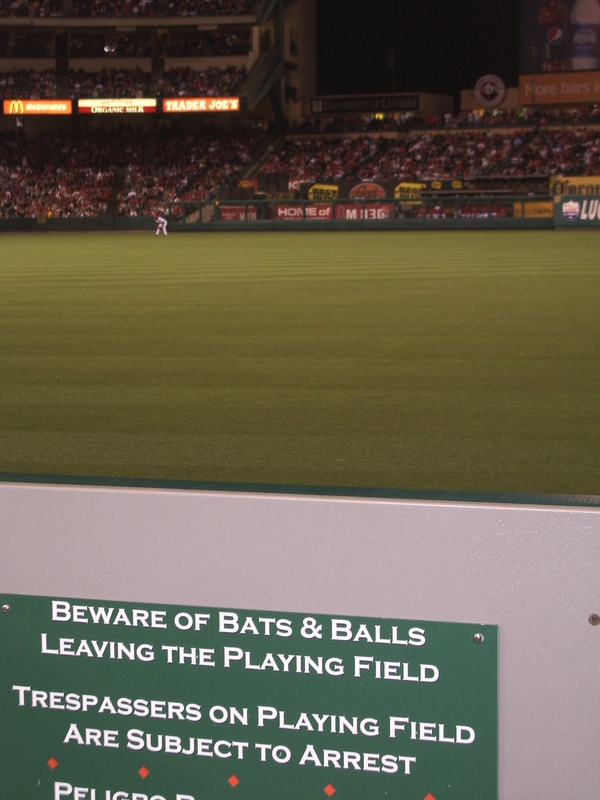 I headed up to the Home Plate Gate anyway. At about 5:00 the rain had lessened again but I just knew there wouldn’t be batting practice. I called Michelle, who had planned on meeting me at the game, and she decided to just go home… she told me if the weather got better she might drive out to meet me later. I considered just calling it a night right then (I thought about my streak–I’d snagged at least one baseball at 43 consecutive games). 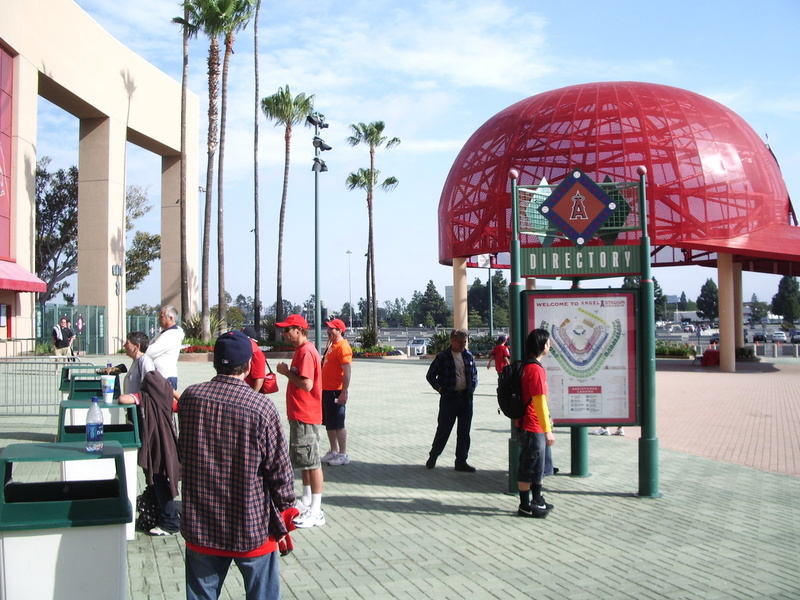 I ended up heading inside–grabbing my giveaway item (an Angels wall calendar) as I went. 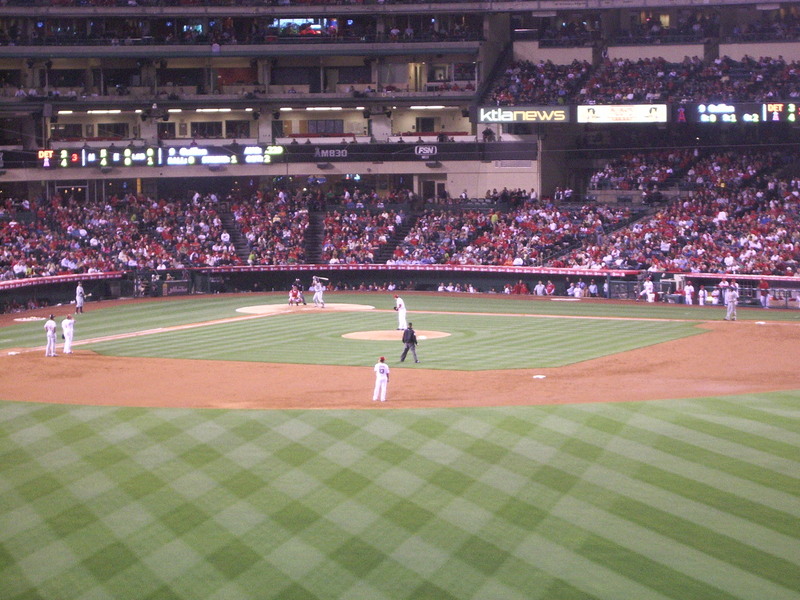 I ran toward the first base side and out onto the field level. Cue the sad trombone. No BP. 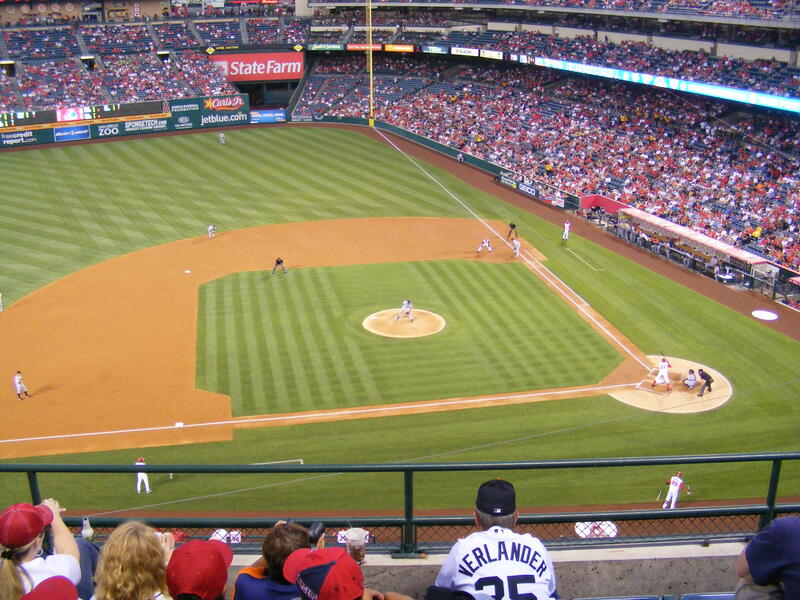 I did see a few Angels throwing over near left field–so away I went. 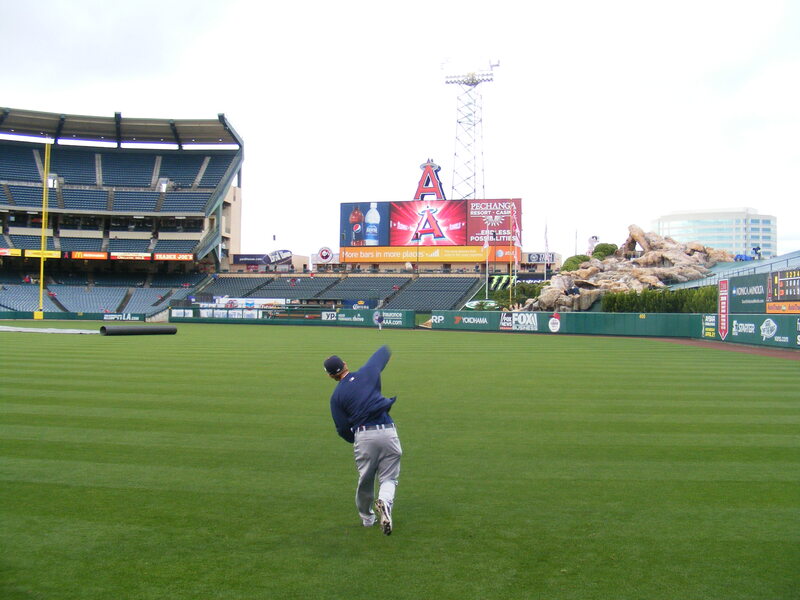 Now that is long toss. 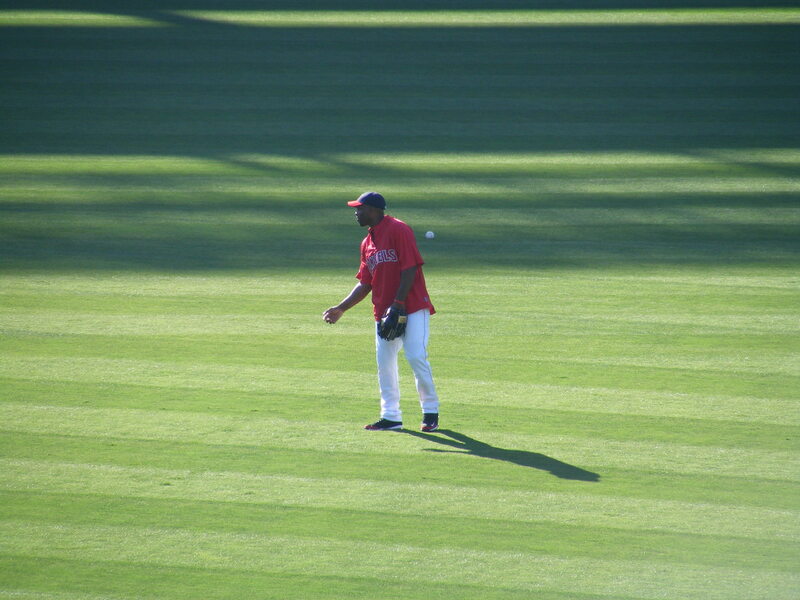 Rodney almost threw one over the center field fence. Now, let me just say that the player looked to be Hispanic. Also, according to my roster the Angels have three players with the surname Rodriguez on their forty-man roster… all pitchers. 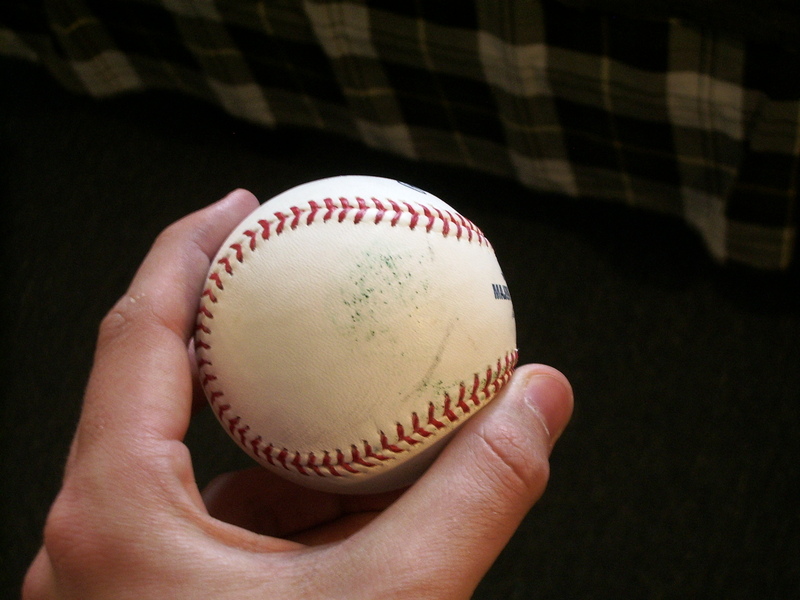 The player turned, saw my glove up in the air, and tossed the ball over a few rows of fans and to me. 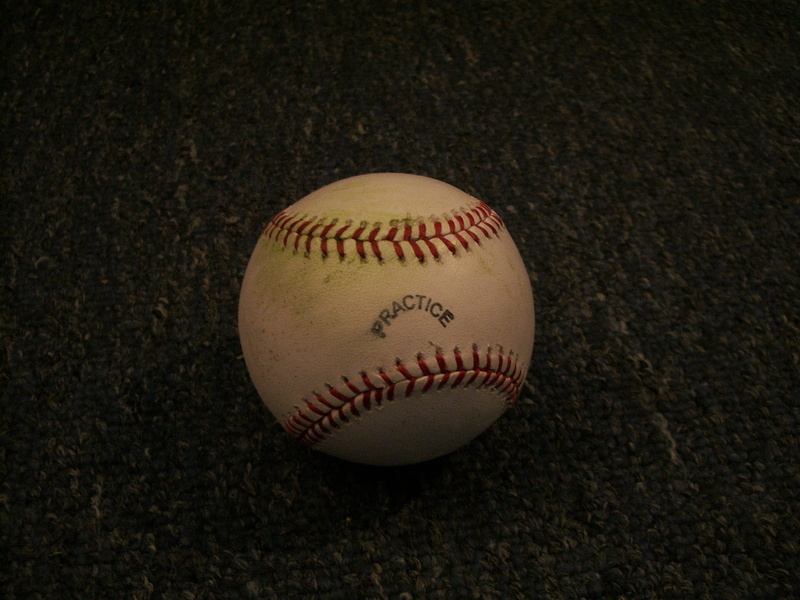 I bobbled it–but held on and, just like that, my streak was at forty-four. 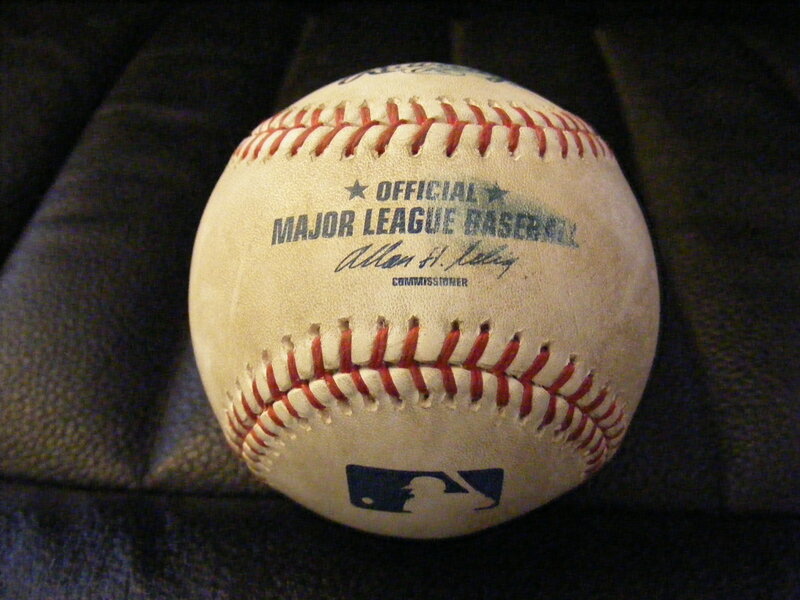 After checking photos at home I confirmed that it was Francisco Rodriguez who threw it to me. 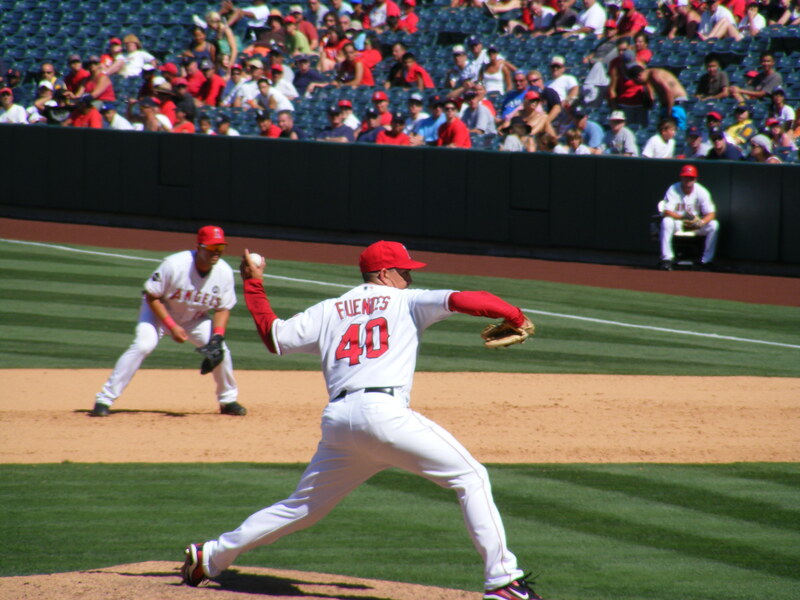 Not the one who used to be an Angel and is now a Met… a different Francisco Rodriguez. He has since been reassigned. 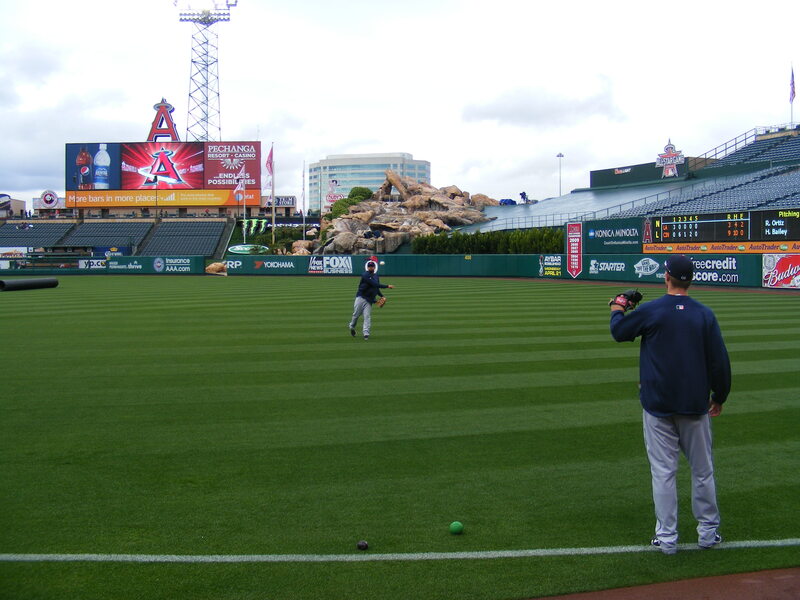 I walked over to the bullpen. Mike Butcher was heading toward the dugout and the rain had continued… I asked if they were going to play if this kept up and he assured me they would. After that… nothing happened. For a while. Seriously. Around 5:45 the grounds crew felt the weather was good enough to take the tarp off the infield. They were right to do so, it wouldn’t rain for the rest of the night. And finally, a couple of Tigers came out to throw. By this point I had decided that I would just head home before the game started (due to traffic, the weather, and wanting to watch LOST). 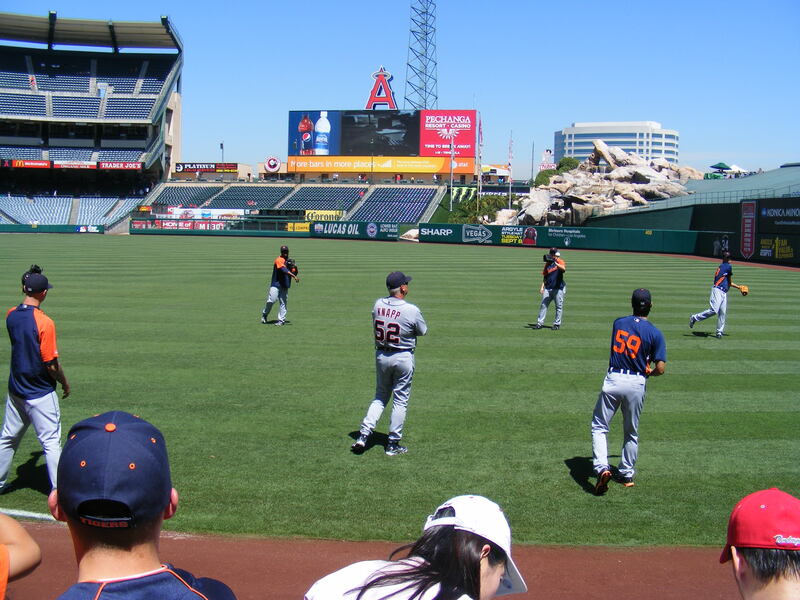 I watched Ryan Perry and Joel Zumaya throw. 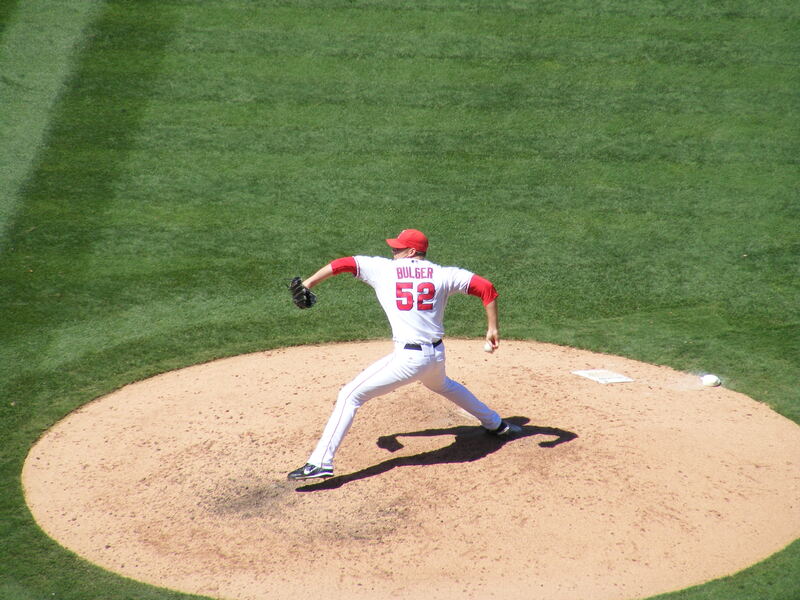 I stood behind Perry for a few minutes as Zumaya pitched fireballs to him. Yikes! And they put on their own long toss show. 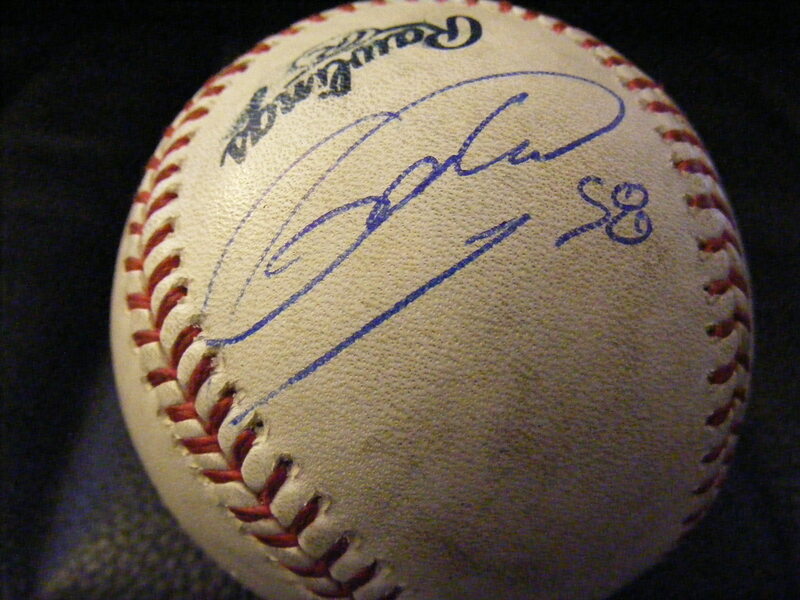 I ended up getting both of their autographs on ticket stubs, and Phil Coke signed a baseball for me, too. 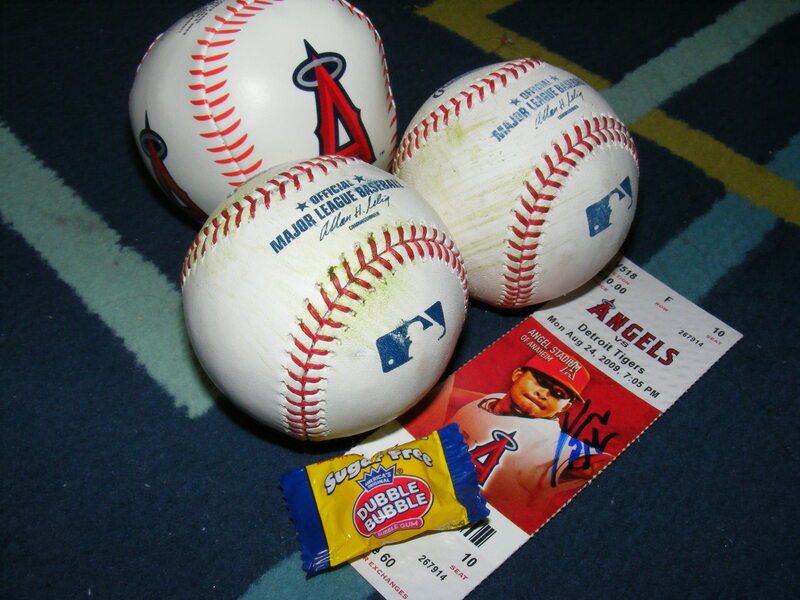 Three autos, one baseball, a free drink, and a calendar. A quick night. 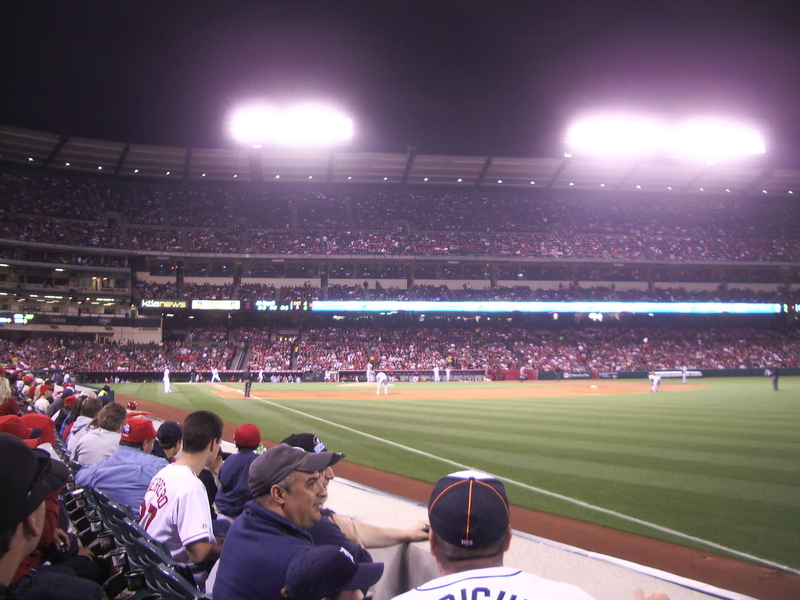 Tigers vs. Angels… the Halos were back home from an awful road trip and won the night before this game. 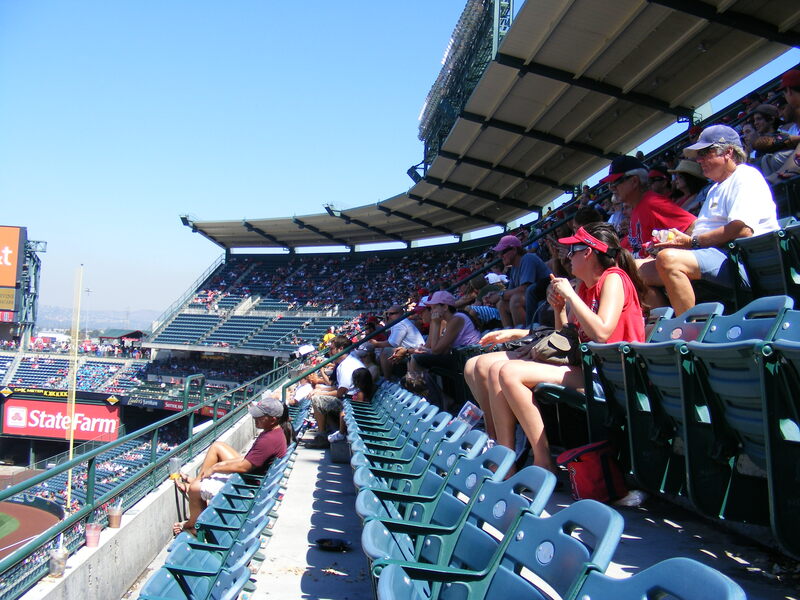 I was 0-2 at Angel Stadium as far as seeing my home team win. Let’s just say I was hopeful. Man, even on days that I expect small crowds there are SO many people at this stadium. The paid attendance was over 43,000! 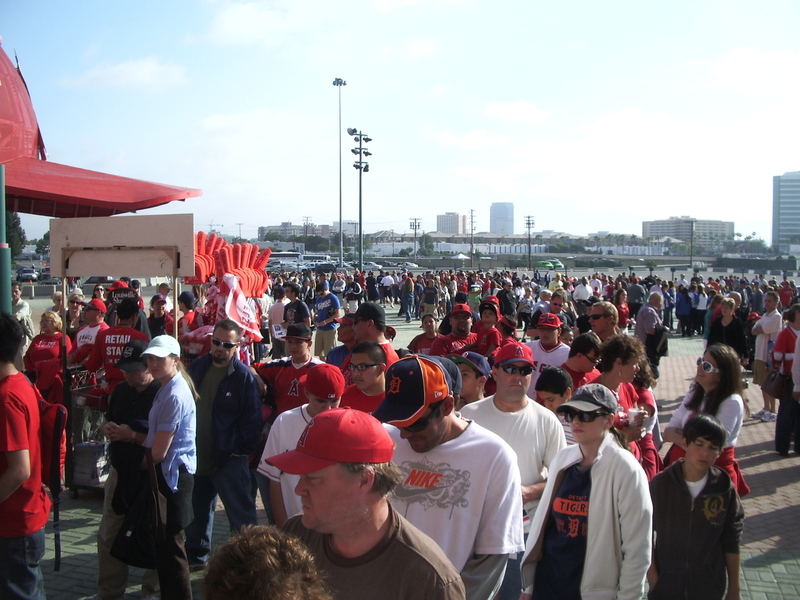 Most of them, however, were not there for batting practice AND most of them did not run in and set up shop in the pavilion… like me. 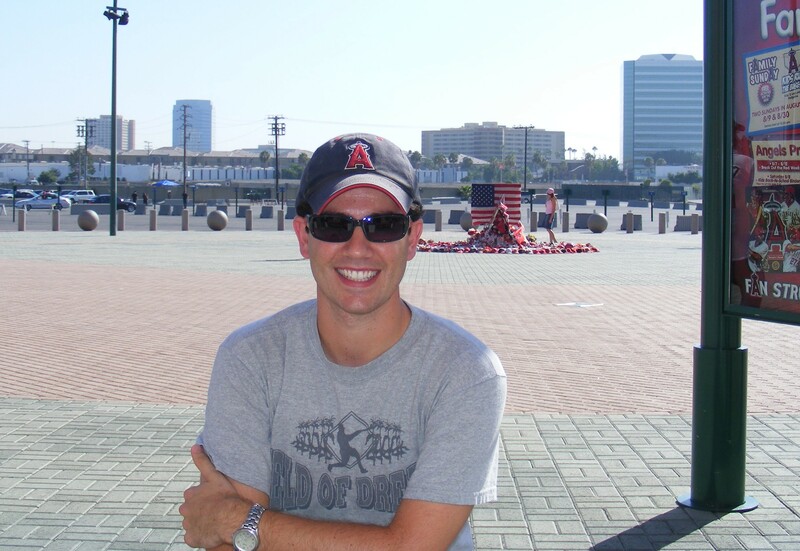 OK, so baseball #1 came to me from the friendly arm of Angels reliever Justin Speier. 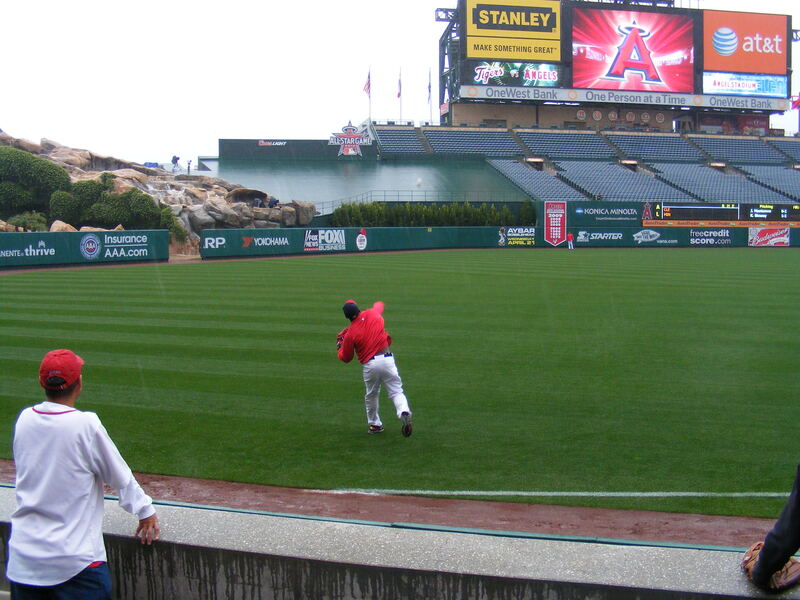 As a group of Angels pitchers jogged along the warning track there was a ball 18 ft. below my spot in right field. 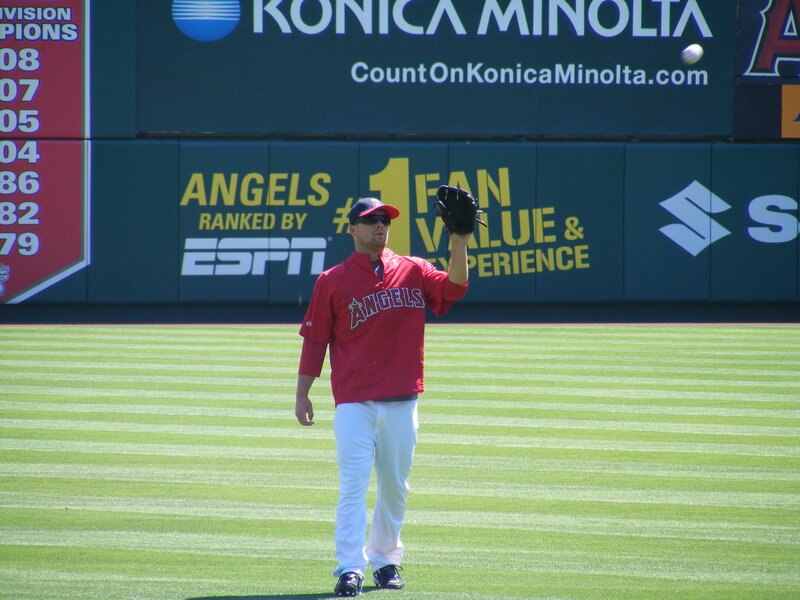 I yelled, “Hey, Justin, could you toss that ball up, please?” And he responded, “Aw, man… I would love to.” Funny. And there it was, my first of the day, complete with a black PRACTICE stamp on the sweet spot. Bleh. The font and logo are different, they feel different, they’re made in China… but it was something NEW! Cool. When I have thousands of baseballs in my collection I’ll probably look back on this and think, “Boy, I was really excited about a lame international whatever ball.” But for now–it’s way awesome. 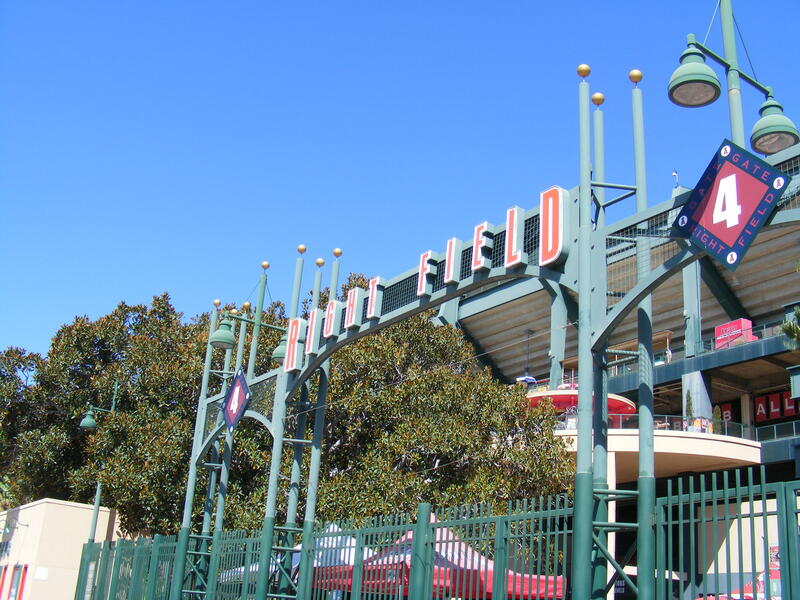 Feeling that I had exhausted my resources in right field I headed toward center, to the corner spot of the pavilion. 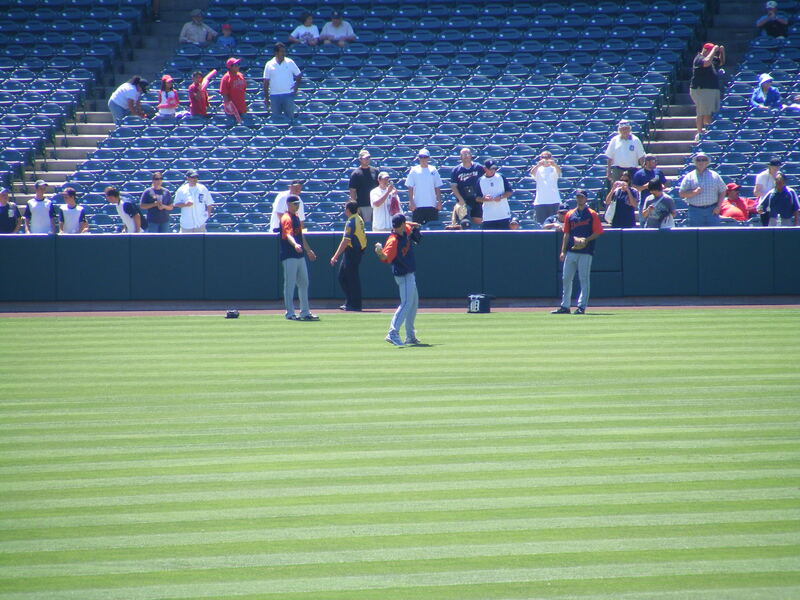 A few Tigers players were taking Fungos in center including Matt Treanor and Curtis Granderson. An odd combination? Yes. Anyway, Curtis ran down a fly ball that I didn’t think he could reach. I mean, he sprinted forty feet, leapt at the wall below me and caught it in the tip of his glove. I said, “Nice wheels!” And he looked up, grinned, and did like, a corny 1990s I’m-using-my-hand-like-it-is-a-gun-to-show-you-I-approve thing. My friendliness paid off. 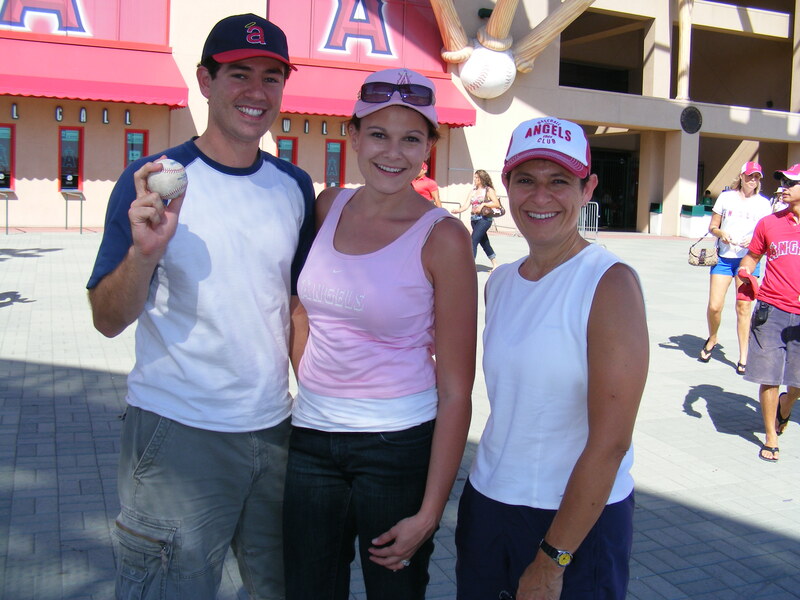 The next time he was nearby I asked if he could toss up a ball… and he did! 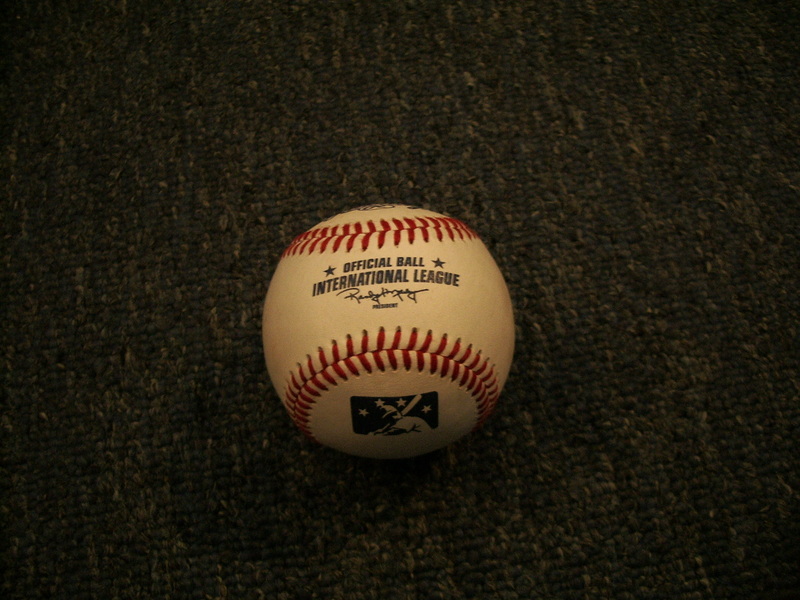 Another International League ball and my third souvenir of the day. At that point Michelle, who’d be meeting me at the game, called to say she was stuck in traffic, so I took a timeout from snagging to make sure she could get to the stadium. 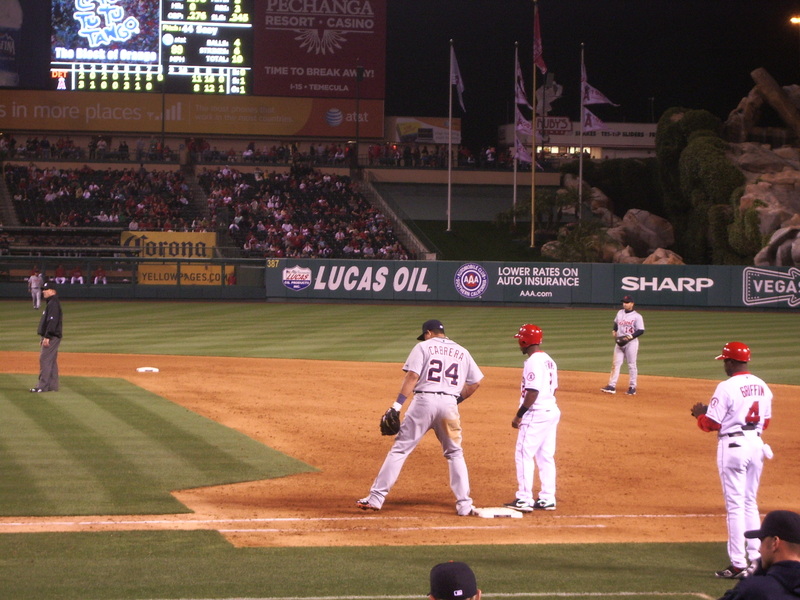 When I headed back my corner spot was occupied so I hung back a few rows as Mr. Granderson stepped into the cage. That guy not only can run… he can HIT! The night before he smacked a pair of homers and he was killin’ the ball in the cage, too. 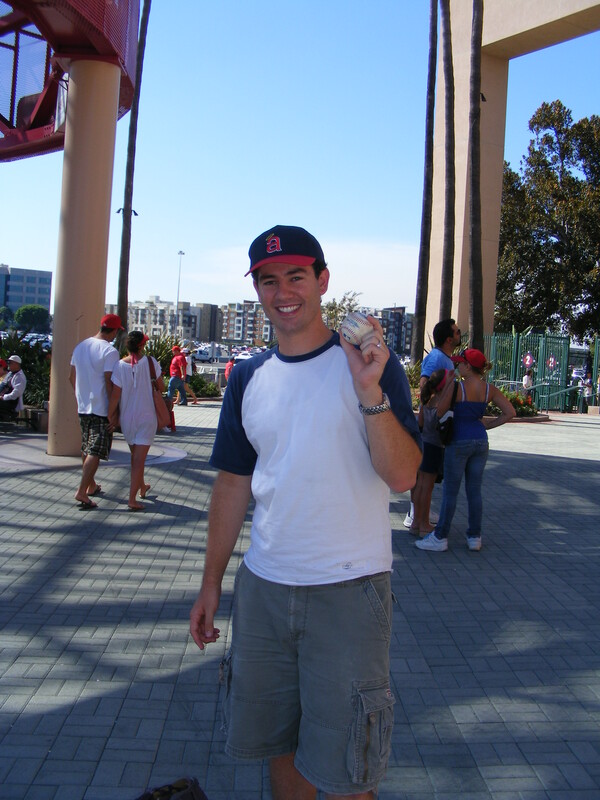 Before long he belted one to right center and it went right over the glove of the guy in Tigers gear who’d taken the corner and bounced around in the row I was in a few feet from me… ball #4 on the day! 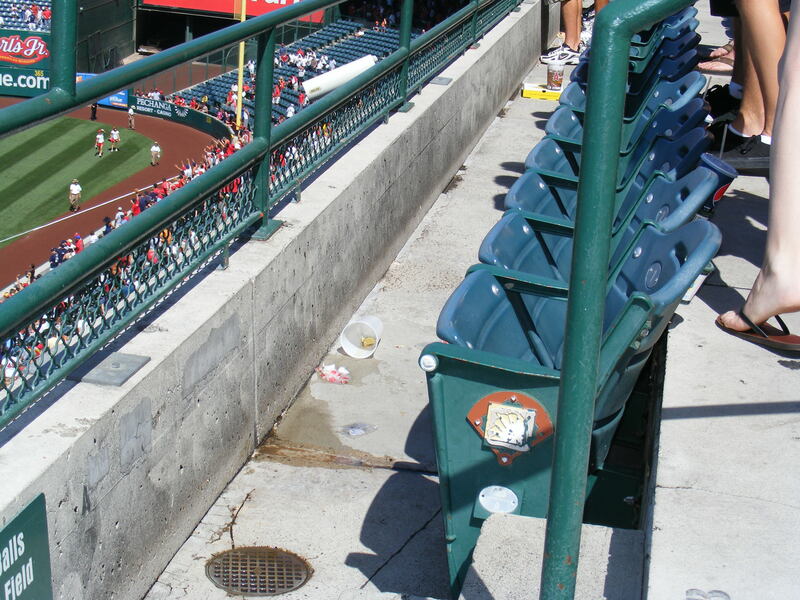 In the photo below you can kind of see the green marking that the seats left on the ball when it smacked into them in the pavilion. See that guy on the left in the photo above? He stumbled (drunkenly) down the aisle and started talking to the dudes in front of Michelle and I about how he was a Marine and how his buddy had bet him a car (a Porsche nonetheless) that he wouldn’t run out on the field and high five the right fielder. He spent twenty minutes trying to psych himself up, asking for advice, trying to figure out “what that sign” actually meant. 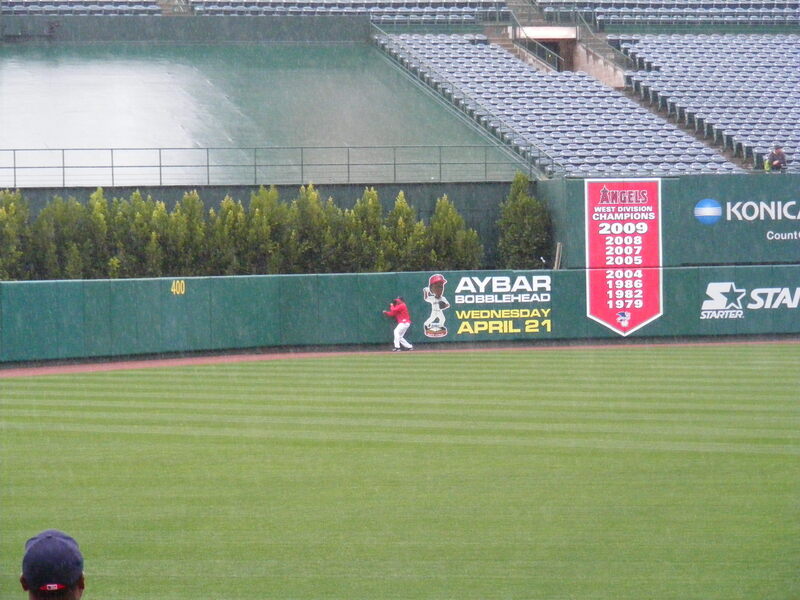 Then, randomly, a dude in a gray hoodie two sections to our left leaps onto the field and starts sprinting. Three security guards and a cop chase him. So this genius in front of me stumbles over the wall as if he thought, “Well, if he can do it, I may as well do it, too.” He wobbles, jogs to Gary Matthews Jr. in right and I can see him explaining and gesturing that he’s gonna get a car if he high fives this man. Gary shakes his head and crosses his arms so this drunk dude kind of taps his hand and starts to then run away, Then he notices a cop ten feet from him and puts his head down and calmly walks off… to get arrested. I remembering hoping he actually would get a car out of it. In the meantime, the first dude in the gray hoodie is STILL running full speed away from the guards. He gets grabbed by the sleeve, wriggles out of his hoodie, and makes a beeline back for the stands where he came from. He makes it over the wall but is met by two guards in the aisle. So, he’s going to jail for the night, too. They never put that stuff on TV… it was really amusing. Downright hilarious, as a matter of fact. Two guys runnin’ on the field at the same time, totally not associated with one another. Ha! 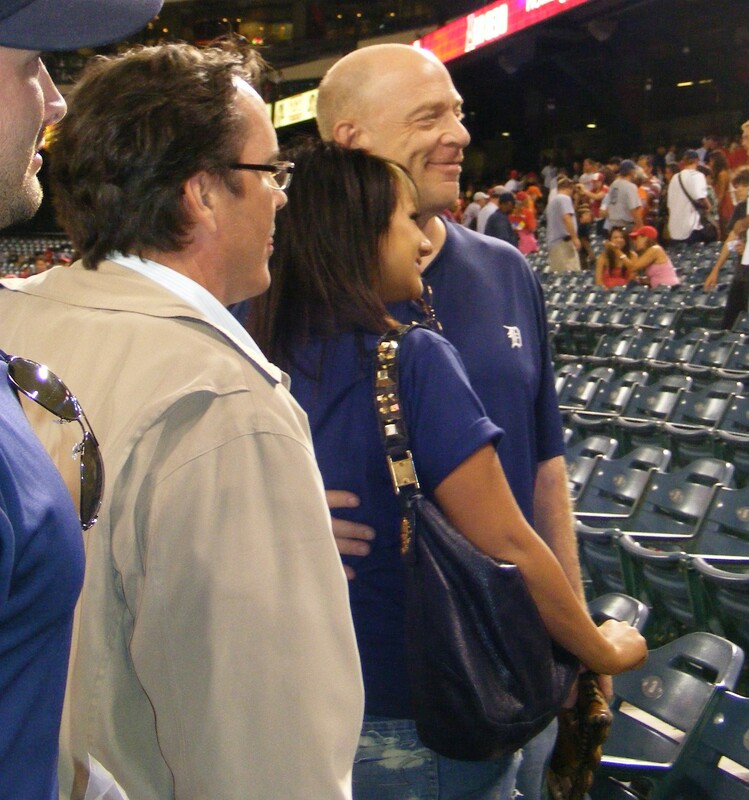 So, the bullpen gave up some runs and a bunch of fans left and Michelle and I moved to right behind the Tigers dugout. 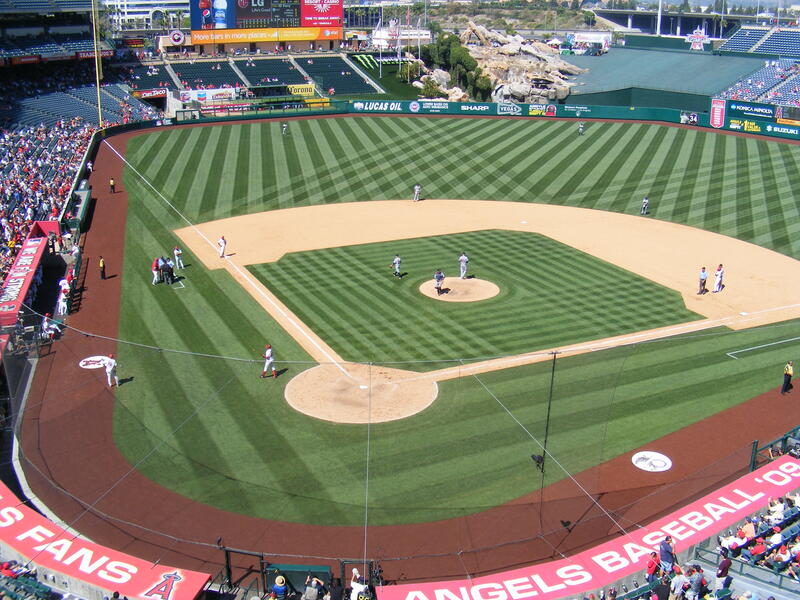 It was 12-8… in the ninth the Angels made it close, 12-10. 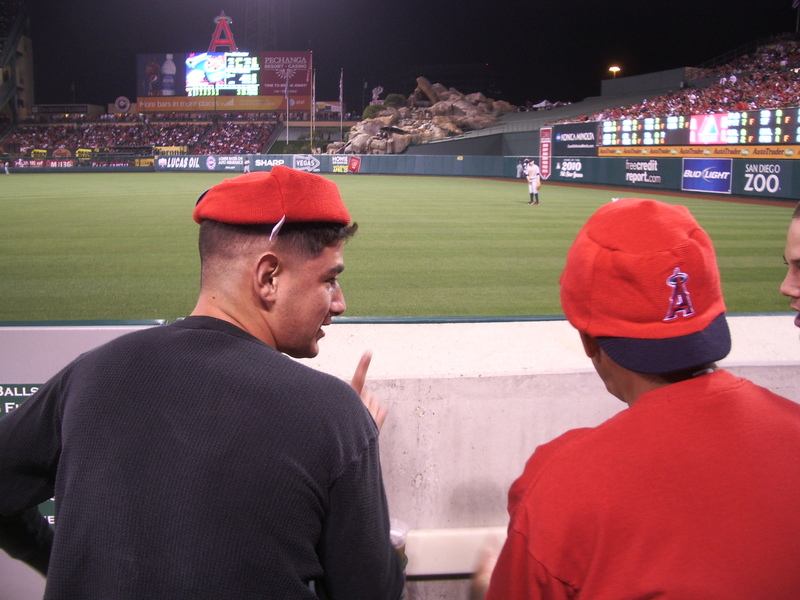 That’s where the score stayed, though, and the Angels lost again while I was in attendance. Bummer. It was an exciting game though, 22 runs scored, home runs, double plays, I love all that stuff. I grabbed a few ticket stubs on my way out… and, oh! Actually, it’s kind of lame… no offense, Gerald, I shoulda had my black Sharpie ready… bah! 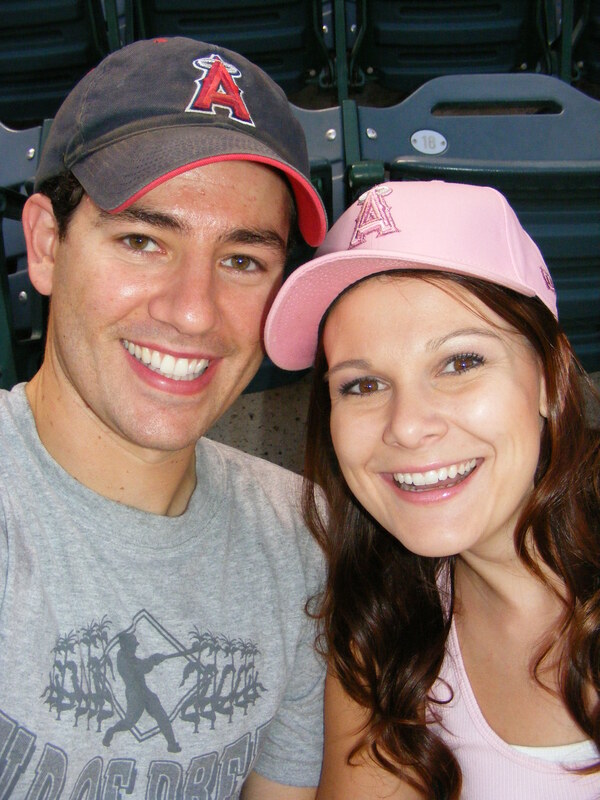 I’ll be at the game Saturday to watch Ichiro, Griffey, and the M’s with Michelle and some friends from out of town. It should be a good matchup!